Hear God's Call. Answer with Faith. After collecting lots of donations and using lots of hands we assembled over 65 ‘shoe boxes’ to be donated to Operation Christmas Child. 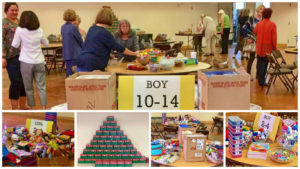 This international Christian organization distributes these boxes around the world to needy children with the gift and Hope of the Christ child. This entry was posted in The View From Iona. Bookmark the permalink.